Above: Photo credit: PBS. 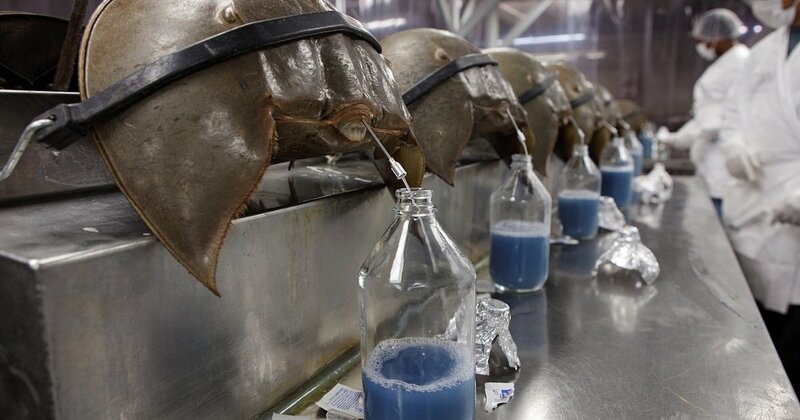 Horseshoe crab blood being drained for use in checking the sterile state of medical equipment. You don’t survive for 450 million years without learning a trick or two. In the case of horseshoe crabs, one of those is developing blood with remarkable antibacterial properties. Humans haven’t been around nearly as long, but we learn fast, including how to harness those properties in ways that save our lives, but aren’t so great for the crabs. The most obviously unusual aspect of crab blood is that it is bright blue, a consequence of using copper-based hemocyanin to transport oxygen where vertebrates use iron in hemoglobin. Instead of white blood cells to fight infection, many invertebrates have amebocytes, and Atlantic horseshoe crabs (Limulus polyphemus) have evolved these to such a peak of refinement that they are of enormous medical value. Unfortunately, overharvesting in North America has led to a decline in crab populations, with worrying implications if this continues. In order to sustain the species, the harvesters take 30% of the blood from each crab, after which they are returned to the ocean. While this portion of blood is meant to be an amount the crabs can survive, it is thought that 10-30% don’t. Moreover, among the females that do recover they often breed less after being bled. However, at $15,000/l plenty of people still think the crab blood is worth bottling.